Today is 12/12 and there are 12 days until Christmas and I just found out we are number 12 on The List!! I'm not superstitous or anything but if I were, I would definitely think that was more than a coincidence. Either way, I'm very excited to know that we have moved up so soon! 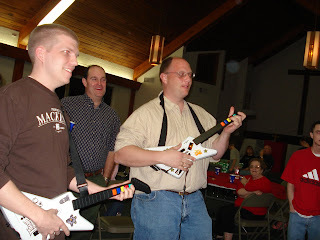 This is Dean and his cousin, Ben, playing Guitar Hero III at the youth Christmas party last weekend. Dean now has a new item on his Christmas list!